Search for all "HOXB1 / HOX2I"
Rabbit anti Canine, Equine, Human, Mouse, Porcine, Rat HOXB1 / HOX2I. 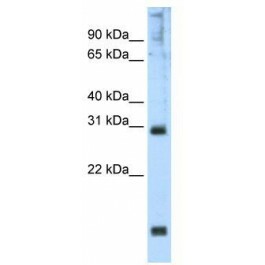 The immunogen for anti-Hoxb1 antibody: synthetic peptide directed towards the N terminal of mouse Hoxb1. Synthetic peptide located within the following region: QQPPSSLGVSFPSPAPSGYAPAACNPSYGPSQYYSVGQSEGDGSYFHPSS. Sequence-specific transcription factor which is part of a developmental regulatory system that provides cells with specific positiol identities onThe anterior-posterior axis. Acts onThe anterior body structures.